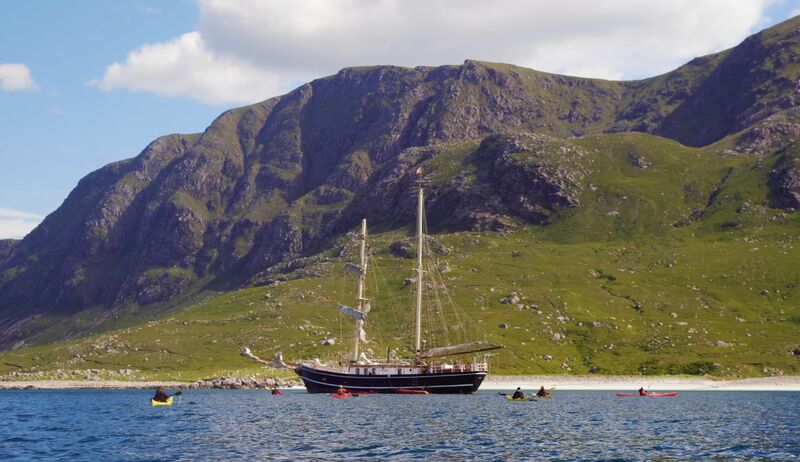 This unique journey will allow us to discover the stunning islands and coastline of Harris, Lewis and North Uist from the convenience and comfort of a tall ship. Starting and finishing our journey from Lochmaddy allows us to pick and choose where and when we wish to kayak. There is no set itinerary, so we can select the locations to kayak in, when we paddle, and when we set sail according to the tides and the weather. We will take time to paddle the island studded Sound of Harris, home to seals and otters and wonderful views across Uist and Harris. Further north up the west coast of Harris lies the beautiful island of Taransay, and even further up the coast we can explore the wild country that lies around Scarpa. Here we can kayaking into caves, landing on glorious beaches and soak up this truly wild landscape. To the south lies the Monach Isles, which sit off the west coast of North Uist. This is home to the world's biggest grey seal, and with many small islands making up this archipelago there is always something new to discover around every corner. Another option is to sail east to the beautiful and remote Shiant islands off Lewis's east coast. Home to thousands of puffins, and with its own stunning rock formation, with 500 foot cliffs these islands are waiting to be explored. Clearwater Paddling offer this unique sea kayaking and sailing experience aboard the Brigantine tall ship “Lady of Avenel”. The Lady of Avenel offers a comfortable base from which we will set out each day for our kayaking explorations. Accommodation is in twin cabins, with hot showers and flush toilets aboard. The catering will be to the high Clearwater Paddling standard and meals will be taken in the comfortable and well appointed saloon. We will need eight bookings for this trip to run, so please keep this in mind if you thinking of joining the tour. We are happy to take provisional bookings for this trip. The Lady of Avenel will be captained by Stefan Fritz with two crew. You are more than welcome to become involved in crewing, and experience tall ship sailing at first hand, literally learning the ropes, taking responsibility on the helm, and with harnesses, climbing high into the rigging. There will be no compulsion to work the ropes, but being fully involved will certainly add a new and enjoyable dimension to your sea kayaking holiday.